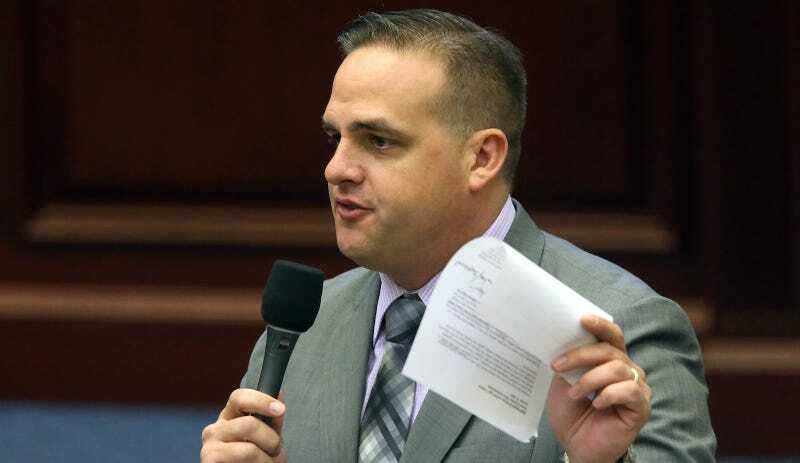 Florida State Sen. Frank Artiles (R). Image via AP. Artiles, who was also accused of punching a college student in the face two years ago (he denied it), was somehow elected to Senate District 40 in November. “He said, ‘If it wasn’t for these six niggers,’” Gibson said. By way of explanation, he added, “‘I’m from Hialeah,’” she said. “I said, ‘OK, Perry, I’m done,’” Gibson said. Gibson left the conversation to go to the restroom. “I said, ‘Dude, did you say ‘niggers?’” Thurston recounted. “‘No, I said ‘niggas,’” which is different in his mind.” But not in Gibson’s and Thurston’s, they said. Thurston, who leads the legislative black caucus, again urged Artiles to apologize to Gibson, but she didn’t come back to the table. She told the Herald, “It’s just the most disrespect I’ve ever encountered.” Politico reports that Thurston arranged a meeting between the two for Tuesday morning so Artiles could apologize, but he didn’t show up. In a text to Politico, Artiles tried to claim that his use of the N-word was not racist because he was using it to insult white people—not a persuasive argument, to put it mildly.